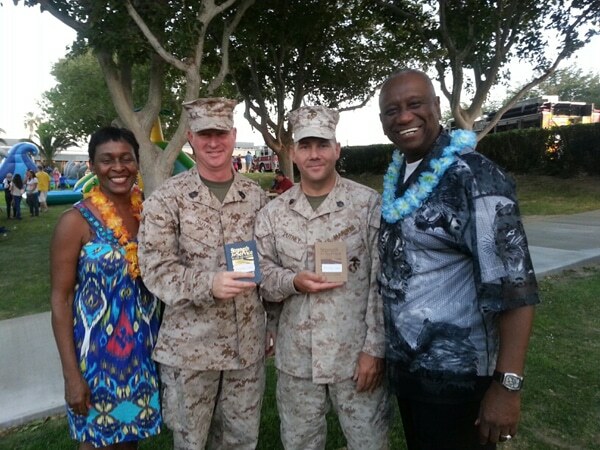 Approximately 800 guests attended the CFC kick off at the Marine Core Logistics base in Barstow, California on Sept. 27, during the Ohana Festival. Larry Dozier, president of the Western Jurisdiction for the United Methodist Men, attended the event for Larry Coppock to expose the Strength for Service booklet to the charitable givers of the combined federal campaign (CFC). This marks the first year that the SFS book was in the festival, and the objective was to make givers aware of the book, so they could have a chance to donate to the cause during the CFC period, (Oct. – Dec). The goal is to place a SFS booklet in the hand of every active member of the United States Military forces. Music played throughout the campus as festival participants ate all sorts of Hawaiian fare. Children and adults alike played the many game on hand. They jumped into the foam game, crawled through the Ultimate Survivor, tumbled down giant water slides rode the waves as life-sized, plastic dolphins looked on and frolicked about. The event ended with a live performance by dancers from the various Polynesian Islands. Audience members applauded the fire dancer throughout his performance. Hostesses walked around and handed out leis to attendees. The weather cooperated. Temperatures had been in the high 90s and sometimes triple digits the week before, but on this day, it was in the 70’s and 80’s with a cool breeze.